The bright and air-conditioned apartment is located on the ground floor of a family house, surrounded by greenery, with a balcony overlooking the wonderful park. The area is ideal for those who like to spend a relaxing holiday and for families with children. Furnished and equipped with care, has a double bedroom (12 sqm), kitchen and living area with sofa bed (12 sqm), flat-screen satellite TV, bathroom with shower (5 sqm), balcony (4 sqm), free WiFi, parking private (4 parking spaces near the house). The shared garden of 900 square meters, with tools and games for children, shared barbecue in the garden. The sandy beach is ideal for children and for those who love the sand at 700 m, the grocery store at 500 m with an attached bar. 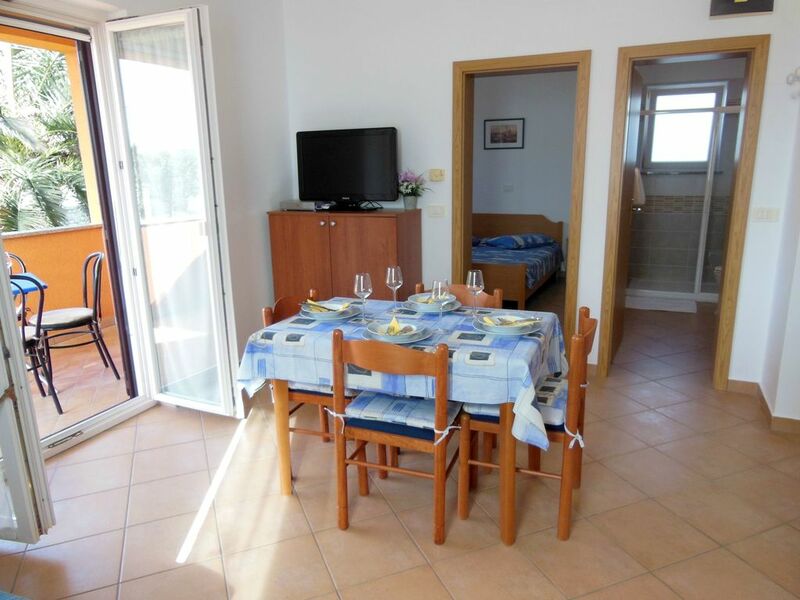 The apartment is located in Zambratija a small fishing village near Umag. The area is unique for its well-equipped sandy beach ideal for children where you can rent deck chairs and umbrellas. The Destino bar on the beach is perfect to spend relaxing evenings admiring the sea and the wonderful sunsets while enjoying the delicious drinks of the bar. The small supermarket with the adjacent bar is great for coffee in the morning. In the area there are various possibilities for sports, excellent fish restaurants, pizzerias, bars on the beach. It is possible to make several excursions for a fee by booking at Trevitours: boat trips, coach trips, trips to Venice, PN Brijuni, Pula. In Umag there is a children's playground, aquarium, museum to visit. A few kilometers from Grissignana the city of artists, Motovun is known for the film festival, Hum is the smallest city in the world, Aqualandia (water park) and more. * Registration only on the first day, per person € 7, to be paid in cash on the spot. La registrazione solo il primo giorno, per persona 7 € , da pagare in contanti in loco. Si pregano i gentili ospiti di avere cura dei elettrodomestici. Eventuale danno sara' addebitato in loco.